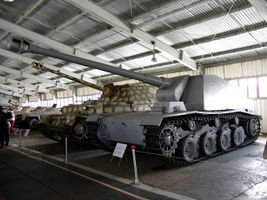 The Sturer Emil is a German tier 7 tank destroyer. Cazacarros experimental desarrollado sobre la base del carro pesado VK 30.01(H), este vehículo estaba equipado con un prototipo de cañón antitanque de 128 mm. Solamente se fabricaron dos vehículos. Ambos lucharon en el Frente Sur del verano al otoño de 1942. Las pruebas mostraron una serie de problemas y el vehículo nunca fue fabricado en serie. The Sturer Emil is somewhat of a departure from the previous two German tank destroyers, the Pz.Sfl. IVc and the Nashorn. Unlike its predecessors, it has absolutely no problems with gun depression. In fact, the gun depression is so amazing, it allows the use of tactics other tanks could only dream of. However, it has a very low top speed and poor acceleration due to a measly, weak engine, making it a somewhat inflexible machine. It also retains the very poor armor and large size of its predecessors, making it a vulnerable target. 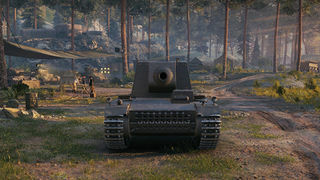 Its top gun has extreme alpha damage and penetration for its tier, almost matching those of tier 9 heavy tanks, but it can only carry 15 rounds of ammunition. If the driver of this tank is using this gun, they must be absolutely sure to make every shot count. Beware - the Sturer's win rate is among the lowest in the game. The majority of players do not find this tank's play style rewarding. The Sturer Emil leads to the Rhm.-Borsig Waffenträger. The Sturer Emil is a rather inflexible tank. It is fragile, very slow, and slow to turn. Its open top and light armor means that it's very vulnerable to artillery. However, this tank can excel by using its amazing gun depression on maps with hills and ridges. It is best at peeking over the top of a rise, taking a shot with that awesome alpha, and then pulling back down out of sight. If ridges are not available, the Sturer Emil can also play a traditional tank destroyer role and use its 370m view range to outspot the enemy at extreme distances. 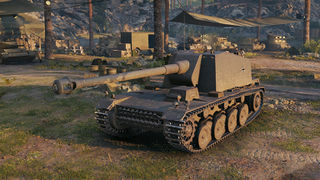 With its poor acceleration, slow rotation speed, and light armor, the Sturer Emil is not good at peek-a-boom around corners, nor at retreating if it is spotted. On a city map it is often best to stay behind a line of heavies and carefully shoot over and around them as they move back and forth. Use their armor to protect you as much as possible. The grind to the top gun is not fun. The stock 105 mm doesn't do enough damage to intimidate opponents. It requires the Sturer Emil to be exposed more often to deal damage. With the 128 mm top gun the alpha damage is great. Getting to a place that you can inflict that damage is the challenge. The more that you can leverage this tank destroyer's amazing gun depression, the better: hills are a Sturer Emil's best friend and should be relentlessly abused. Maps with a lot of flanking and movement will be a trial, though. Try to stay near friendlies who can keep you from being over run. Your primary job is to support your friendly tanks so they can keep you alive. The aim time on the 128 mm is a mediocre 2.5 seconds. With only 15 shells available you want to ensure that you hit with every one possible. Don't underestimate the value of a 630 damage HE shell on the rare enemies that are too hard for you to penetrate. Keep in mind that it only takes 2 or 3 hits for a reasonably good game. Get 4 or more hits, and you'll be having fun! Nothing carries over from the Nashorn. 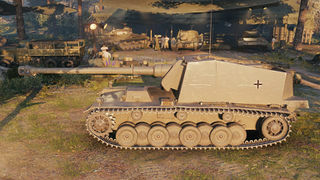 You might have the radios unlocked from other German tanks, but the gun and engine are unique to the Sturer Emil. Unlock the suspension so you can equip everything you want. The engine can be unlocked whenever: It's a minimal boost but 1200 exp is gotten on a single decent 2x so researching it won't slow you down a whole lot. The 12.8 cm Selbstfahrlafette auf VK30.01(H) "Sturer Emil" (German for "Stubborn Emil") was an experimental World War II German self-propelled anti-tank gun. It was based on the Henschel VK30.01 chassis and both armed with a Rheinmetall 12.8 cm K L/61 gun (based on the 12.8 cm FlaK 40). This gun could traverse 7° to each side, elevate 10° and depress -15°. It carried 15 rounds for the main gun. The chassis was left over from Henschel's submission for the canceled VK30.01 heavy tank program, but the hull was stretched and an extra road wheel added to accommodate the large gun, which was mounted on a pedestal ahead of the engine. A large, open-topped, fighting compartment was built where the turret was intended to go in the original design.